LAHORE: A delegation of All Pakistan Newspapers Society (APNS) met Speaker Punjab Assembly Ch Parvez Elahi here on Sunday and briefed him about the problems being faced by the Punjab based publications because of the new advertising policy, especially money owed by the government organisations. 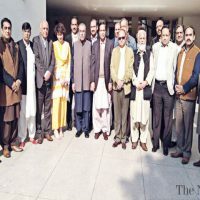 The delegation included Mehtab Khan, Mujibur Rehman Shami, Tameeza Mizami, Khushnood Ali Khan, Sarmad Ali, Jamil Akhtar, Mumtaz Tahir, Usman Majeed Shami, Bilal Mehmud, Shahid Mehmood, Humayun Gulzar, Rehmat Ali Raazi, Dr Tanveer Tahir, Naveed Chaudhry, Sardar Khan Niazi and Imran Ather among others. The Speaker Punjab Assembly said that APNS problems and difficulties are genuine and he hoped that problems were solved soon, as large scale dismissals of media workers was a source of concern. He said that the media should not only do criticism but also guide the government and the opposition for solution of the national and the common man’s problems. He said as a Speaker my role is neutral, for the first time in the history of the Punjab Assembly in-camera briefing was held on Sahiwal like incident, Elahi said that for the first time law was made in the Punjab for issuing production orders which benefited the opposition; the law for issuing production orders was in all the assemblies but there was no such law in the Punjab, he added. APNS delegation termed the tenure of Ch Parvez Elahi as the chief minister as a golden era particularly for the media and said that system of newspapers and television was going on very smoothly, establishment of colonies for the journalists are such works which can never be forgotten, besides this, he had undertaken ideal and historical reforms for the welfare and well-being of the people, Surgical Tower in Mayo Hospital, Burn Centres, setting up of cardiology hospitals and Multan Burn Centre in health sector are worth mentioning. Speaker Punjab Assembly Ch Parvez Elahi said that APNS problems and difficulties are genuine, want these to be solved soon, large scale dismissals of media workers are source of concern. He said that the media should not only do criticism but also guide the government and the opposition, as a Speaker my role is neutral, for the first time in the history of Punjab Assembly in-camera briefing was held on Sahiwal like incident. Ch Parvez Elahi further said that the law for issuing production orders was in all the assemblies but there was no such law in the Punjab. Mayo Hospital, Burn Centres, setting up of cardiology hospitals and Multan Burn Centre in health sector are worth mentioning.